I retired from the senior bank official in 2010 when I was in the climacteric. I felt the society didn't need me anymore and I had a bee in my head all day long, and sometimes I had abnormal sweating due to the general debility and sometimes felt depressed. In addition, I had a heart interatrial septum occlusion surgery, and also was attacked with bronchitis, arthritis and many other diseases. When I was busy, I didn't feel physically uncomfortable, but after I retired, it seems all diseases come to you, making you depressed and uncomfortable. 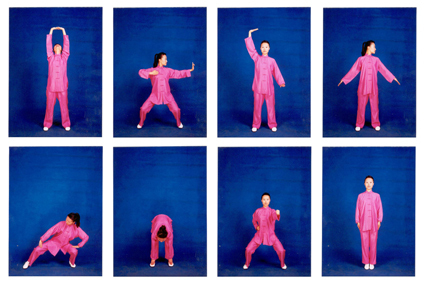 Once by chance, a friend told me that he was exercising Ba Duan Jin, which is beneficial for health. She encouraged me to exercise. I wanted to try it, so I searched the teaching videos of Health Qigong promoted by the General Administration of Sport of China on the internet. I was fascinated in it. And I learned the movements from the videos on my own. It was difficult at the beginning, but I insisted on. I learned from the internet, and meanwhile read books about Health Qigong and 200 questions about Health Qigong, and also subscribed magazines about Health Qigong. Within one year, I learned Ba Duan Jin, Yi Jin Jing, Liu Zi Jue and Wu Qin Xi. Exercising Health Qigong does not only have an effect on keeping fit, but also makes me get benefits of "cultivating the moral character". 1. The benefits of Health Qigong in "cultivating the moral character". After more than four years of exercise, I understand that the most important is to comprehend the concept of Health Qigong, not only doing physical exercise. In a sense, the concept of Health Qigong affects me not only limited to the Health Qigong itself. The concept of Health Qigong that I understand is the man and nature holism concept. Motion appears motionless, and what is pursued in the opening and closing and the advance and withdrawal is the integrated harmony and balance of the body and the mind. I like finding a quiet place to exercise every day, with my feet opening, having the same width with the shoulders, bending knees slightly, relaxing the entire body and staring ahead. Raise arms slowly to the height of chest, with Laogong acupoints in the palms facing to each other. Then, stretch the left and right hands respectively in the opposite directions, imagine you are pulling a rubber band. The movement must be slow and gentle. Try best to think about the universe, roaming far away to the untouchable horizon. When closing the hands, the palms must face with each other before the chest. At this time, imagine there is a spring resistance between two hands, and minimize the thought as far as possible. After doing such a simple opening and closing movement for thirty or fifty minutes, I begin to exercise the four methods of Health Qigong, and two hours lapse quickly like this. I feel open minded and get rid of annoyance. In this process, I gradually understand the importance of "quietness". Quietness is the premise of relaxation, mind using, body regulation, breath regulation and mind regulation. Quietness means, of course, the inward quietness, but not the outward quietness, also not the seemingly quiet appearance with the mind in an uproar and distracted. Quietness is achieved by realizing peace in mind, avoiding to be flighty and impetuous, eliminating straying thoughts, realizing stability, security and comfortableness with calm mind and concentrated will. Only peaceful mind and empty head can realize the real quietness and nourish the genuine qi. In the process, although feet and hands do not move, the genuine qi has been guided to the internal organs with the opening and closing of yin and yang in solemn and respect. The extreme of quietness is motion. It is same true to other sports. Quietness must be realized to achieve motion. The premise of quietness is "respect", i.e. the mind of awe, and the mind of emphasizing the Tao. In the ups and downs, the vicissitudes, the success and failure of life, I obtained the pleasure and cultural deposits brought by Health Qigong. Therefore, exercising Health Qigong is not so much keeping fitness as cultivating moral characteristic. Now, my previous colleagues said I look much better and younger than before, which makes me very happy, with very peaceful and natural mind. This is my largest benefit for "cultivation of moral characteristic" by exercising Health Qigong. 2. Exercising qigong makes me recover from the bronchitis that has attacked for many years, and my cardio-pulmonary function also improves. I was attacked with bronchitis when I was a child due to the pneumonia. I often cough, with many phlegm, and the condition will be severed in case of cold or tiredness. In 2003, I had a heart interatrial septum occlusion surgery due to the congenital heart disease, so I often feel flustered and breath hard. After exercising Health Qigong, I can breathe in and out evenly within the acceptable range, because the reserve-abdominal breath method makes the breath deep, thin, even and long. I can breathe out foul air in internal organs and breathe in the fresh air between earth and sky. Letting the breath gradually slow down and deepen and stretch, making it faintly discernable, and imagining the fresh air will become warm after breathing in, and then get to Dantian at the abdomen, you will feel warm in the abdomen. In daily life, I do reverse abdominal breathing consciously for several times every day. Unknowingly I find I can breathe smoothly, and the symptoms of trachitis are significantly relieved, and my cardiac function is also improved. 3. Exercising Health Qigong relieves the symptoms of my arthritis. I have suffered from arthritis for more than ten years. In the cloudy and rainy day or at the change of seasons of autumn and winter, my knee-joints would suffer intolerable pain, and I can't squat, and I even can't walk normally in severe cases. Therefore, I would do warm-up such as leg pressing and split kick as required before exercising Health Qigong to fully warm up the knee joints. There are many movements that need bending knees and squatting in the exercise. To avoid the joint pain, I insist on relaxing my mind at first after entering the state of quietness, then the limbs and the skeletons of the body from head to toes will relax. Relax, open and stretch the joints. Do not put the gravity on knees, and the direction of motion of knee-joints turn towards tiptoe, but not exceed the tiptoe. Two legs bend down to a degree, and the knees are relaxed as if sitting on a bench. Keep the top of the head lifting the body upward in a sense, sink the shoulder and pull down the elbow, with the chest backwards, the back lifted and the coccyx at the central. A few years have passed. The pain in my legs is greatly relieved, and I even can do the difficult movement like "Sinking the Three Bodily Zones" in Yi Jin Jing, which is unimaginable in the past. I can walk faster with light steps, and feel refreshed. Now, a dozen friends of mine follow me to exercise Health Qigong after knowing that I benefit a lot from it. We gather together to exercise every morning and communicate happily with each other, really achieving the health of both body and mind. Health Qigong allows me to cultivate my moral characteristic as well as keep fit. I like the traditional sports of China from my heart, and I will make every effort in inheriting and carrying it forward and introduce Health Qigong to more people to let them have a healthy and happy life.